You can't toss a stone without hitting a 7-inch tablet nowadays, so Huawei's just announced the MediaPad 7 Vogue with a not-too-common feature: voice calling. If you don't mind a large object plastered to your head, the 3G version of the slate (there's also a WiFi-only model) will let you place network calls just like the ASUS FonePad or Samsung's Galaxy Note 8.0. Otherwise, it's packing decidedly middling specs, like a 1,024 x 600 IPS screen, quad-core Huawei 1.2GHz Cortex-A9 CPU, 1GB of RAM, 8GB of storage, 3-megapixel rear camera and a microSD expansion slot. It'll launch in China this month, though there's no word yet on pricing or whether fans will be able to score it elsewhere. Check after the break for PR and another image of the tab. [Shenzhen, China, 24 June, 2013]: Huawei, a leading global information and communications technology (ICT) solutions provider, today launched the HUAWEI MediaPad 7 Vogue, the latest in Huawei's range of products that make great technology accessible. With a 7-inch display, aluminum unibody and quad-core processor, the MediaPad 7 Vogue provides the perfect mix of functions from a tablet, smartphone and entertainment center in one stylish and portable device. "Building on the popularity of the HUAWEI MediaPad series, we've created a new tablet that caters to fashionistas, technology seekers, entertainment junkies, and people who simply expect more from their technology," said Richard Yu, Chief Executive Officer, Huawei Consumer Business Group. "We're delighted to introduce the MediaPad 7 Vogue, our call-enabled tablet with world-class entertainment capabilities and long-lasting battery power. The MediaPad 7 Vogue is a perfect example of Huawei's dedication to making extraordinary experiences possible." The HUAWEI MediaPad 7 Vogue boasts a built-in receiver for direct calling capabilities that remove the need for headphones. It features a powerful quad-core 1.2GHz processor CPU and 16-core GPU, fluid 3D gaming and 1080p full HD video playback. The 3G module supports DC-HSPA+, and downlink speed can reach up to 42Mbps, and the Wi-Fi connection supports 802.11b/g/n for fast streaming of movies or videos. MediaPad 7 Vogue also features a 4100mAh Li-Polymer battery and Huawei's proprietary power-saving technology, enabling playback of four HD movies or more than 20 hours of continuous calling on one charge. The MediaPad 7 Vogue's antenna performance is top-class, exceeding most operator standards in the US and Europe. With its strong and sleek aluminum metal unibody design, the MediaPad 7 Vogue is ultra light and compact at just 9.5mm thin and weighing only 335g. Its 7-inch capacitive 1024 x 600 (IPS) multi-touchscreen with full view-angle and vivid display, offers a dazzling visual experience to bring your photos and videos to life. Running on Android 4.1, the MediaPad 7 Vogue is pre-installed with email, word processing, Facebook, YouTube, and GPS navigation, and also features Huawei's proprietary Emotion UI 1.5 providing a more user-friendly and personalized experience. Offering seamless connectivity, the MediaPad 7 Vogue's Micro USB port is compatible with a full-range of accessories including an external keyboard, mouse and USB flash disk, while the Bluetooth, Wi-Fi, and Airsharing functionalities allow for swift content sharing wherever you are. 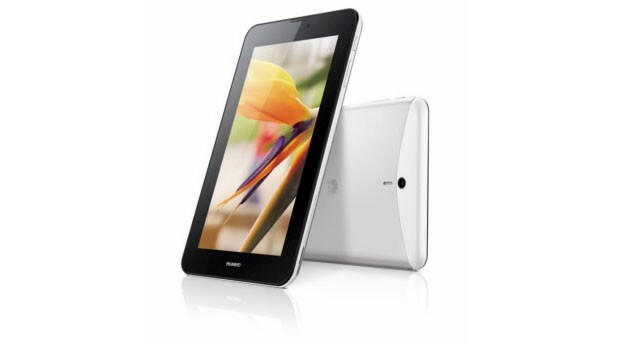 The MediaPad 7 Vogue comes in black and white and will be available in China this month, with other markets to follow.